Hi everyone, just received my Nomad pro today and it took me a while to get the zeroing down. I have to say this is my first experience with CNC of any type. My question is if I have a 4x4 inch stock, and I have an object that is only 1 inch in width, height. how could I tell Meshcam where I want to print it on the stock? 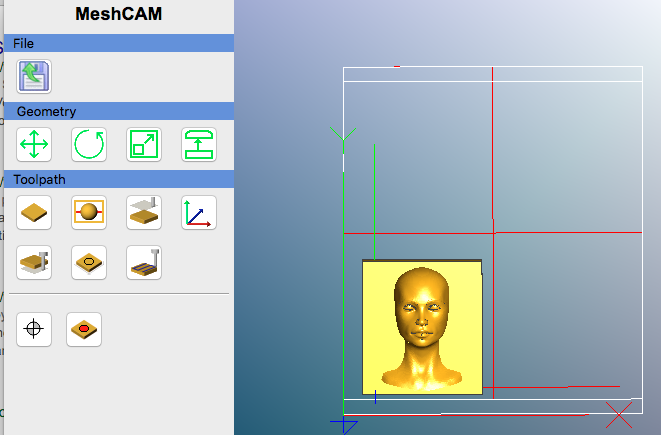 For example in the image below, how would I tell Meshcam that I want to print my object in the upper left quad? I was hoping there was a way we could just drag our object anywhere on the stock. There a couple ways, possibly a few ways you can do this. When defining your stock at 4x4 inches you can make the “front” margin 3.000 inches and your “right” Margin 3.000 inches. You can make your programs stock at 1"x 1", then when you set your machine zero make your machine Y zero offset 0+3.000. It is pretty common in industry for a machinist to do it this way. To do this, you may have to touch off on your Y on the bottom of the part set it’s zero then jog +Y 3.000 inches then set the zero again after jogging. Thank you Seth, very helpful information. When placing a small piece in a big stock, remember that construction tabs are necessary to keep the piece from breaking free from the stock and causing problems (or going flying). To pull this off, expand the stock around the object by enough to allow for the tabs and add the tabs. One can place the X0Y0 anywhere within the stock - as long as the object fits. Eyeballing it and/or a ruler check (with some safety margin) will suffice. The Nomad has no idea that the stock is bigger than indicated in MeshCAM. The tabs will be attached to the larger stock. This avoids playing with offsets.